The Alabama World Affairs Council (ALWAC) presents nationally and internationally known speakers from both civilian and military life. The mission of ALWAC is to promote public awareness and understanding of international affairs as they relate to United States interests. Our sponsor, Troy University Montgomery, has graciously provided for our main speaker events the Gold Room on the 2nd floor of Whitley Hall, 231 Montgomery Street, 36104. For a parking map and directions, see below. Our national affiliation is with World Affairs Councils of America, in Washington DC. ALWAC has attracted leading authors, academics and practitioners from both the U.S. and abroad. Join us for a distinguished series of speakers and dialogue with a diverse group of people. 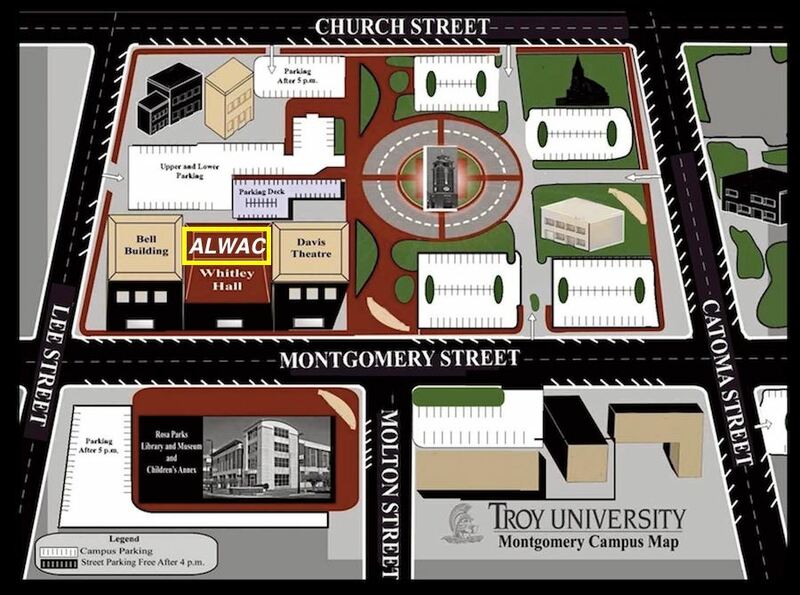 There is ample well-lit parking near Whitley Hall (the old Whitley Hotel at 231 Montgomery Street) on the Troy University Montgomery campus. The Montgomery Symphony, with programs starting two hours later, has used the Davis Theater, next door to Whitley Hall, for years without incident. All evening programs will be in the Gold Room on the second floor of Whitley Hall. Signs will be posted to direct you to the Gold Room. 1. The Parking Deck at the rear of Whitley Hall. Enter the parking deck via the circle in the middle of the Troy campus. Exit the traffic circle at 9:00 o’clock if coming off Montgomery Street or 3:00 o’clock if coming off Church Street, passing behind the Davis Theater. Park on the second level to gain immediate access to the second floor. 2. There are several open parking lots around the circle on the Troy campus. 3. On-street parking in front of Whitley Hall is free after 6:00 pm. The information of these pages is supplied by AWAC officers, with some images from Troy University officers. The website was created by Marla Vickers of Auburn University Montgomery, in 2015-16; and updated and maintained by Prof. Jeremy Lewis of Huntingdon College, from August 2016. Site managed by Troy University. The Alabama World Affairs Council is a 501(c)(3) non-profit organization.